How about I make 2 cables out of that one? Just add it to the bunny do list. Well, Lucky, do you feel really lucky? Oh Yes, Jane! I am one lucky son of a Buck! I get the best rabbit care west of the Mississippi. I had my own room built onto the house for me and Pebbles, my doe-friend. But she has gone on to bunny heaven. I eat almost nothing but what Randy grows out in the rabbit garden, parsley, bean, peas, arugula, lettuce, basil, thyme, and cilantro, all organically grown with my bunny potties as fertilizer. I even had about 10 nice big parsley pots and he brought one in each day for me to eat down, and then I got to eat the roots too! I'm getting one bean plant a day right now and I ate most of the pea plants too. I get to hop into the main house during the day where I get good traction on the carpet so I can do my fast hopping and "fancy" hopping. I get to run circles under the bed and hide there. What a life! It's great to be a rabbit! I am a very lucky bunny! 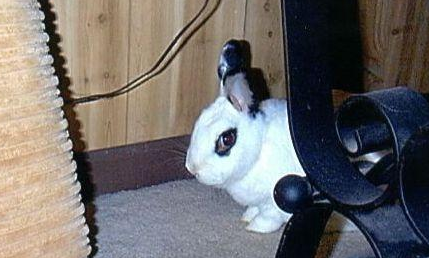 My mom rescued me from the grim reaper one day before it was too late from the fort worth humane society, where she was a volunteer and considered the bunny expert. Hey! This is Randy I wrote that!